BoomTown returns to the Matterly Bowl estate, Winchester for Chapter 9: ‘Behind the Mask’ another unapologetically bonkers weekend of head spinning fantasy and genre-spanning music. The alternative music, fringe comedy, theatre arts festival is the curious ravers paradise and it’s barely half an hour away from Southampton – how convenient! Unrivalled in its diversity BoomTown brings together artists from electro swing to reggae as boundless creativity creates another world! BoomTown is split into nine totally individual districts – thankfully there’s no dystopian Panem shenanigans, just fancy dress themes and eclectic music, 22 main stages and 100s of acts tick every musical fancy. The Specials have been announced as headliners for this summer’s festival. The 2 Tone and ska legends will bring their rocksteady beats, Doc Martens and Wayfarers to Hampshire, hot on the coattails of Madness’s headline slot last year, continuing BoomTown’s ska music hot streak. Sadly drummer and founding member John Bradbury passed away in 2015 but the band continue to fill dance halls for fans young and old with hits such as ‘A Message To You Rudy’ and ‘Ghost Town’. The Specials will be found in TrenchTown in the very heart of the city. The home of Reggae, they will share the illustrious stage with Ziggy Marley whose 2014 record Fly Rasta won the reggae heavyweight his seventh Grammy, must be in the genes! 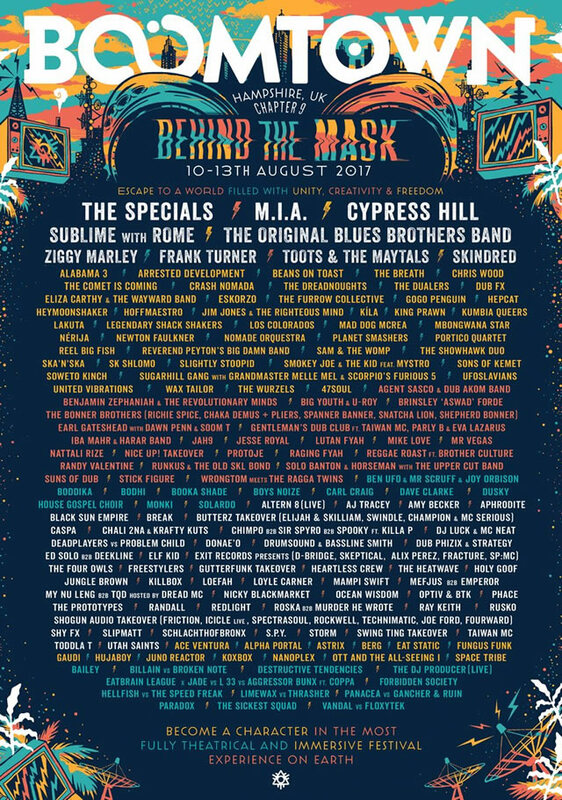 Hip-Hop legends Cypress Hill will join the ska superstars on the TrenchTown stage – just toss that ham in the frying pan. B-Real thankfully found time outside his Prophets Of Rage schedule – the supergroup he formed with Chuck D and DJ Lord of Public Enemy and three-quarters of Rage Against the Machine, to make the trip to BoomTown this summer. The West Coast quartet recently celebrated the 25th anniversary of their iconic self titled debut by re-releasing it within a black resin sculpture of their skull logo. Expect a set list stuffed with classics like ‘Insane in The Membrane’ and ‘Aint Going Out Like That’. M.I.A rounds off the star-studded TrenchTown line-up. The Sri-Lankan born and London-bred rapper, social activist and philanthropist will bring her mash of rap, nursery rhymes, bhangra, electronic dance and punk to BoomTown- 2007’s banger ‘Paper Planes’ included. Frank Turner will rock out in the dusty streets of the Wild West, alongside cowboys and buxom dames. Positive Songs For Negative People, his sixth album reached number two in the UK album charts upon release in August 2015 (beaten only by Dr Dre’s first album in 16 years). In 2016 Frank played a record 10th consecutive slot at Reading and Leeds and by the time BoomTown rolls into Winchester he will have played over 2’000 shows. With no end in sight join Mr Turner as he spends his entire life on tour. Regular collaborators Joy Orbison and Boddika will take to the stage in the Barrio Loco, the ruling fiesta district. Joy Orbison hit the ground running with his debut single ‘Hyph Mngo’. From then on he has coalesced house, garage and jungle into his progressive repertoire. Record label SunkLo is co-owned by the two DJs and their collaborations are as enchanting as they are exhilarating. ‘Mercy‘ and ‘Dun Dun‘ were released to wide acclaim. Sector 6 surrounded by woodland in the North Easterly corner of the city will captivate the crowds with stunning architecture and pyrotechnics. It will be the home for Tom Green’s – aka Rockwell – sojourn in the south. He is without question one of the most exhilarating talents to come out of the drum and bass scene in recent times. Sector six will also see the triumphant return of Shy FX and his exhilarating jungle sound. Enjoy a Gatsby-level of decadence and swing at Mayfair Avenue, swashbucklers and sea dogs in OldTown, a cornucopia of colour in the Psychedelic Gathering, an oriental infusion in Chinatown and a dystopian future in the vowel shy DSTRKT 5. Basically, a bit of everything. A charitable and eco-friendly ethos has always been at the heart of BoomTown and in 2016 they managed to raise a phenomenal £98,654 for a number of charities at home and abroad. Thousands of volunteers donated their time skills and effort to produce a unique eco-friendly festival experience like no other! Chapter 9 requires registration before purchasing any ticket with The Ticket Sellers. Tickets are available from £155 via boomtownfair.co.uk/tickets. Tier 3 tickets can be purchased as a split payment ticket for a deposit of £40. Coach tickets are available from £170 and are a great way to save time money and the planet! Reduce that carbon footprint folks.